Let’s imagine that you have finished with laying out your board in Kicad and you’re ready to make it. What are your options? Well, you can do it yourself at home. 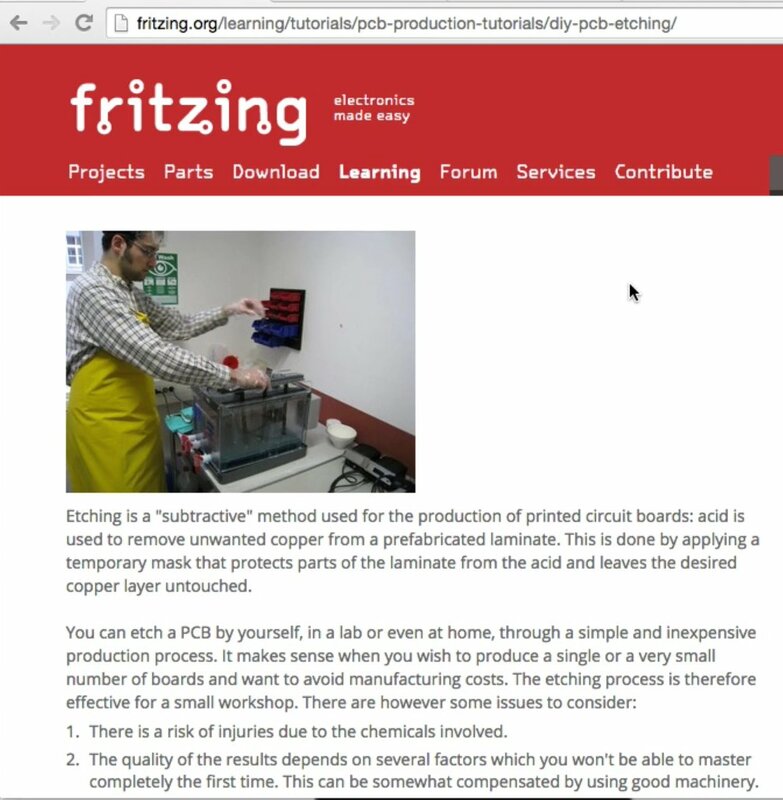 There’s a nice guide here from Fritzing, athttp://fritzing.org/learning/tutorials/pcb-production-tutorials/diy-pcb-etching/. Etching, a process by which you can make your PCBs at home. The process described in the Fritzing article is called etching. It involves the use of various chemicals, in chemical baths. Some of these chemicals are toxic. You have to have special safety equipment, hopefully keep your children away if you have any, deal with smelly and potentially dangerous fumes. Once you have a board etched, you still need to use a drill to create holes and vias, and then figure out a way to connect your top and bottom layers. If this sounds like not your kind of thing (I’m with you! ), then you can go for a professional PCB manufacturer service. OSH Park and other manufacturers like ExpressPCB and Seed are very good at what they offer. You can get a professionally made PCB for not a lot of money and without danger to yourself as well. I’ve used OSH Park and some of these others a lot of times. I’m always happy with the result and it does take a little bit of planning because once you order your PCBs it could take a three or four weeks, at least back here in Australia to get your PCB shipped back to you. If you’re in a hurry there are options to expedite the process, it gets a bit more expensive though. In this book, I’ll be using OSH Park just because I’ve used them before, they’re very convenient and I like the outcome. Their design rules which are fairly standard in the industry, so everything I show you in the book will work with the vast majority of public PCB manufacturers. OSH Park’s design rules are standard in the industry. The typical standard two-layer order will cost $10 for a two square inch board and you get three copies of that. This works out to around $5 per square inch. The pricing is consistent in the industry. You pay based on how big your PCB is. So there’s a good incentive to try and make you PCBs as small as possible. Be aware of this when you do your layout, try to keep the components as closely packed as you can. There is a give and take between the proximity of the components to each other and the amount of space there is left for the routing. The less space there is available, the harder it will be to do the wiring. There’s also ExpressPCB, I’ve never used ExpressPCB myself so I can’t comment about them. 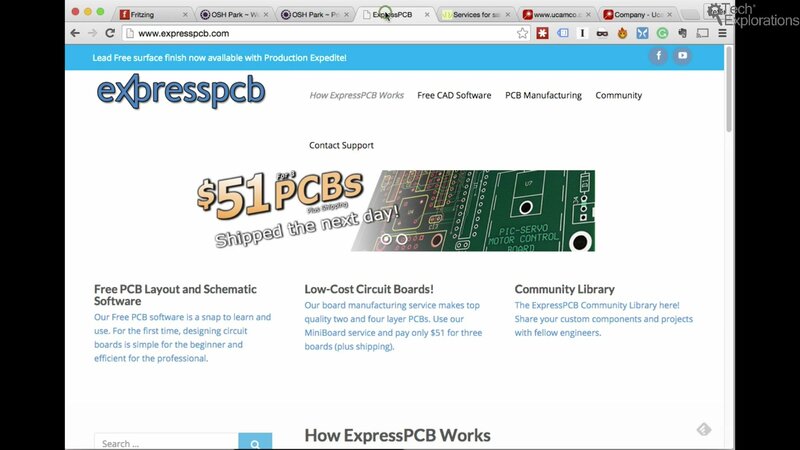 But it seems like also a layer to download for free their own ExpressPCB software and use that to build your PCBs. Another example is Seed. I’ve used Seed in the past, really nice, just as good as OSH Park in my opinion and they do give you a much wider option of how you’d like your PCB to be made. 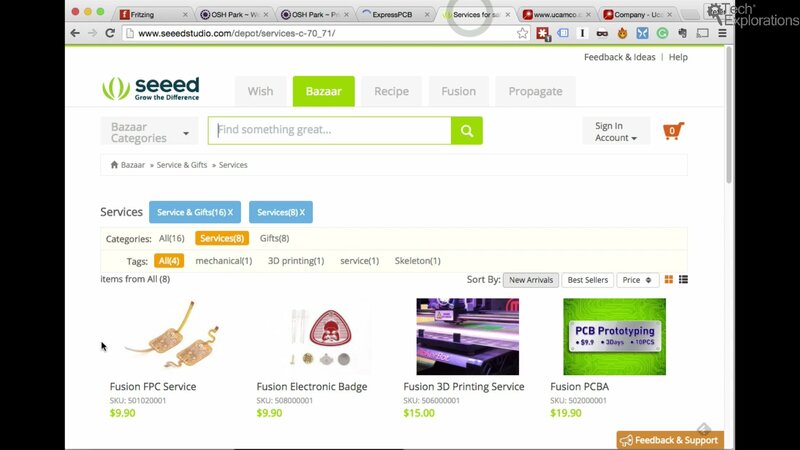 For example, if we go to Fusion PCB that’s one of the types of products that you can get from them. You start at $9,90 but then you can choose things such as how many layers it’d like to have, the dimensions of your PCB. This is a nice one, the thickness, if you pressed for space in your application, if you building a wearable gadget perhaps, then you can reduce the thickness of the PCB. You can choose the quantity, the PCB colour. Nice touch, you can make your PCB red, for example. These are just some of the customisations offered by Seed. 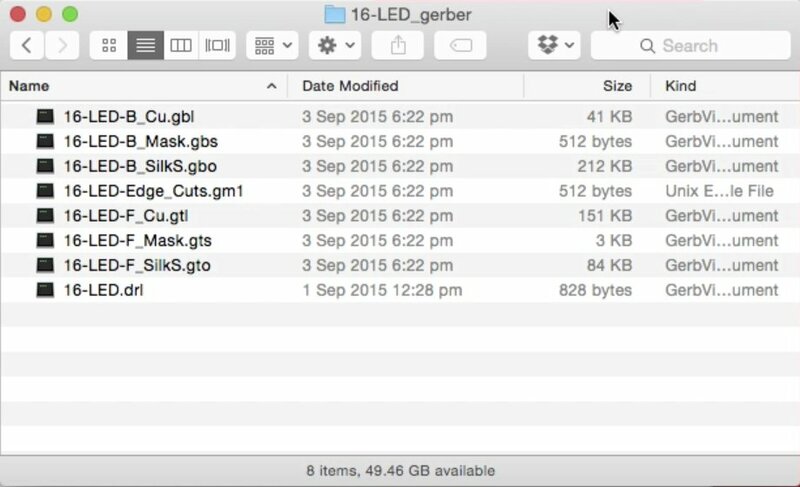 Now, let’s turn our attention to the files that you need to upload for these services and the files are Gerber files. 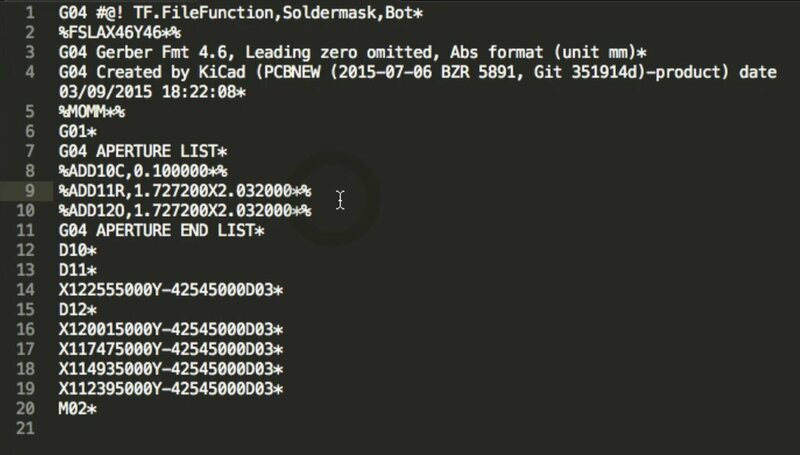 Each layer on your PCB will have its own Gerber file which is simply a text file. You can see that this is just a text based file contains instructions. Although you could edit such files with your text editor, they are meant for the manufacturer’s equipment. An advantage of this text format is that you can use a version control system like Git and keep your projects stored in repositories like Github.com. The Gerber files system and standard has been designed by this company here Ucamco. They make equipment and write software for PCB manufacturers – things like a PreCAM software, PCB CAM, there’s a laser photo plotters and direct imaging systems. 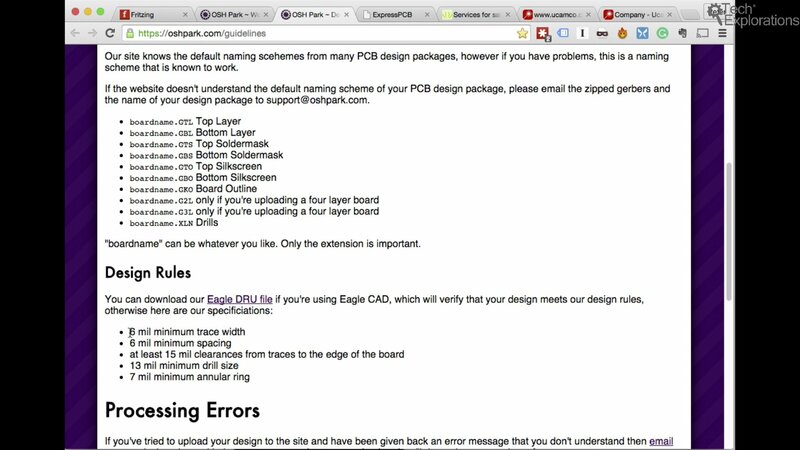 This is the company that makes the hardware that companies like OSH Park and Seeedstudio will use to make your PCBs. If you’re curious about how to read these Gerber files then you can lookup the specification of the Gerber format specification in Ucamco’s web site. Beware, it’s a huge file. That’s enough about fabrication and Gerbers for now. In the next chapter we will get started with the first project for this course and we will build one sided-NRF24 breakout.